Matte periwinkle lavender is filled with sparkle which is lime green when away from light, and turns pink when the angle is changed or is closer to light. Much more sparkly than it appears in photos. After is has fully set, in about 3-5 minutes, you will need to gently press your lips together (or use a fingertip to "dab" all around) to make the sparkle show best. 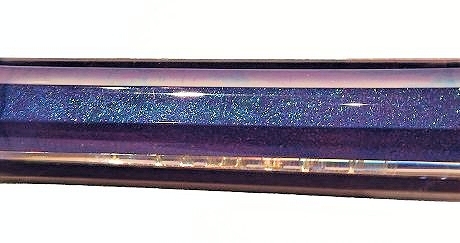 Since the base shade is matte, the sparkle doesn't show up much in the tube.